Have you ever wondered if the answer to your problems, the light at the end of the tunnel, the breakthrough that you needed was easily accessible and could be reached simply by opening a door? Sometimes our problems or challenges or life situations seem impossible or insurmountable and other times they are easily overcome. Perhaps it is because the majoruty of the time we are looking for our answers or solutions in the dark. Sometimes if we just stopped. Looked up and saw the light, even if it is the slightest crack of light and walked towards it, all our answers may be available to us just behind the door. Sometimes it is our own resistance or fear of what’s behind that door that stops us from moving forward. Sometimes it is our stubbornness too. 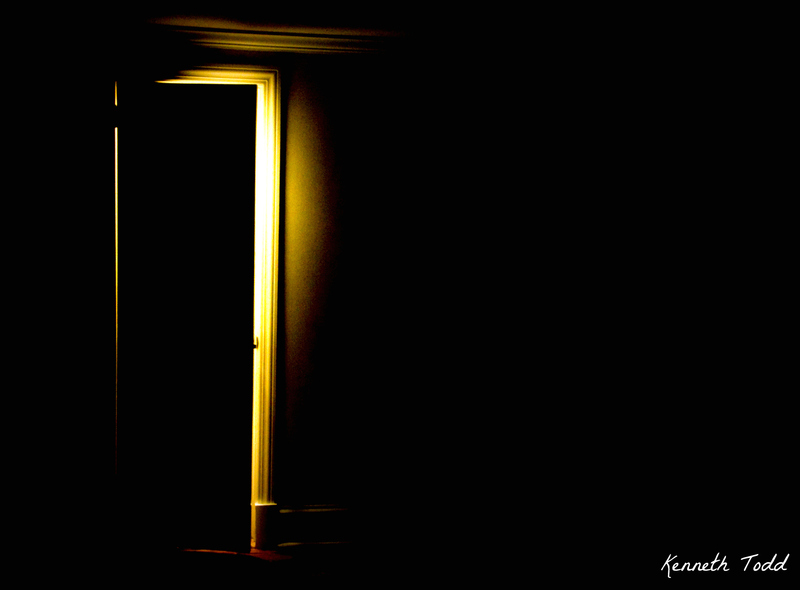 We don’t need the light, we will find the answer any second, it is right here in front of us…somewhere. The light may not be something or somewhere external either, but rather could be right inside of us. So instead of looking externally for the answer, if we go inside, we might discover a space within us, filled with light. Stunning! Makes me think … a lot! what an awesome, mysterious photo. Thanks. Appreciate the comments and thanks for stopping by again. I love this picture! I just started re watching “The Lost Room” last night and this pic reminds me of that movie! Wonderful photo and thought proving words! Tks and glad it had some impact on you. Appreciate you stopping by and the comments. What a great metaphor and image. My spiritual coach always tells me that we have to get out of the mental basement (meaning negativity and ego-centric thoughts of jealousy, anger, judgement, etc.) in order to stay in the light with gratitude and clarity. Thanks for sharing! Thanks Laura and thank you for sharing your comments. Much appreciated. Of course! And I felt compelled to reblog your post. Thanks again, love your pics and insight. As my spiritual coach tells me: banish your ego that holds your negativity: your greed, your judgement, your jealousy, your anger and stay in the light of gratitude. Find your beam of light within, and place your feet firmly inside—especially on your hardest and darkest days—and let the light fill your being with hope, gratitude and love. Float in the light and wait as you meditate. It’s amazing what doors in your mind will start to slide open. Happy Tuesday everyone and thanks for the inspiring metaphor and image Kenneth! Great shot. I loved the idea. I really like how you put so much meaning into every photograph! it really brings to life what photography is all about… bringing out the ordinary and making it extraordinary. keep it up!! Thank you Shirsa, I appreciate your comments. Hei bro. Can i use your photo for my poster? Yes you can but please acknowledge my work.